Ahhhhh, summer weddings on the Outer Banks. The wedding couple has spent many hours picking out a perfect beach location and decidingwhat he/she is going to wear at their Outer Banks wedding. But, what outfit is rightfor a guest? What should you wear sothat you look good and yet don’t take away from the happy couple’s big day? Beach weddings are often more casual affairs than church weddings; however, dressing for a wedding on the beach can take some planning in order not to upstage the bride. Here are sometips on what to wear to an Outer Banks wedding - taking time and location into consideration. Choose your beach wedding attire. For guests to a beach wedding, casual clothing may be appropriate. However, this is still a wedding, so guests should dress nicer than they would if they were running errands on the weekend. For a summer beach wedding, you’ll definitely want to wear something that moves and breathes well. So light cottons, linens, and silk blends are good choices for men and women. Ladies, skip the stilettos in favor of cute flats or wedges. Gentlemen, don’t be afraid to sport a pair of nice sandals. Just don’t forget the pedicure! Women should look for a light sundress for daytime, or a long elegant dress that feels beachy for an evening wedding. The more upscale you want to look, the fancier the fabric should be, with simple cotton being the most casual and satin and shinier materials being the dressiest. For a daytime wedding, men should wear a light shade of khaki or tan for their suit, and a pastel pink or yellow shirt. For a day or night affair, pair an olive or chocolate-brown jacket with white linen or cotton pants and an open-collared white linen shirt. For a more casual look, men could wear dress pants with a button-down or polo shirt. Tip: Men, avoid heavy fabrics. Don't be the sweaty mess in the three-season suit. A crisp, pulled-together look honors the happy couple and may catch the eye of that lovely single guest. And added touch? Try a pocket square. It gives you a finished, polished look so you can forgo the tie, which just traps sweat anyway. One of the most important things to know in advance is whether the wedding will take place on the sand or on grass (or another solid surface). Beach or elsewhere, women should be practical - but not tacky - about their footwear. You don't want to be that guest tramping through the sand in your too high, too expensive stilettos. Beach (sand): You should wear flat shoes to a beach wedding, particularly if it is being held right on the sand. Fancy flip-flops are perfect for most beach weddings - but why not take it up a notch with a pretty sandal? Flat sandals can be both chic and comfortable. Select a thong sandal embellished with crystals, stones or other adornments. Grass or other hard surface: Try kitten heels, wedges, or Espadrilles. Plan for Outer Banks weather. Although not on the formal guest list, Mother Nature should not be forgotten as a guest - bringing with her sun, sand, wind, and possibly rain. Sun: Hats aren't just for the Kentucky Derby or the ballpark, they can be a chic fashion accessory for a summer wedding. Select a hat with a wide brim for optimal sun protection. Make sure to wear makeup or moisturizer with SPF and don't forget your sunscreen. Wind: Remember, it can get breezy at Outer Banks beach weddings. Be prepared to pull long hair back into a ponytail or to use a scarf as a headband. Have a pashmina or wrap for cool breezes. Rain: Make sure you consider an umbrella, hat, or shawl to wear like a headscarf, or be prepared for hair to do its own thing. Tip: Long, floaty dresses for the ladies (or loose hairstyles) may prove troublesome and a shorter, close fitting dress may be more practical if wind is going to be a factor. View Outer Banks weather. What not to wear to a beach wedding. Formal dress is not usual, unless the bride specifically requests it. Avoid wearing jeans, really short shorts (or dresses) or ripped clothes. When in doubt about proper wedding attire, ask a bridesmaid, groomsman, or the parents of the bride, unless the bride is a close friend that the guest would be talking to before the wedding as a matter of course. When in doubt, go slightly dressier and remove a suit jacket or embellished cardigan to simpler clothing underneath. Need a place to stay when you attend an Outer Banks beach wedding. 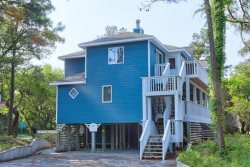 We have nearly 300 Outer Banks rentals from 1-10 bedroom (including oceanfront condos) so you can enjoy the beach while you're here.